Yes. That braggart Nero gave newes to spite me. He guessed there was much about our scandal that I was keeping secret. But I must set this down more orderly. The morning after I last writ, my lord came home to breakfast. He arrkst me why I stared so, and called me a fat owl. In truth, I’d passed the night waking, so I slept that day. My onlie trouble was a noise like sudden thunder. I could scent no coming storm, nor was my fur a-prickle. Later, I visited the stable cats. They’d heared that the brothers Linkin called murderers had fled across the river Hammel [Hamble]. They did not think the brothers had gone far, because a boy had been sent to the kitchen to fetch food for them. The kitchen cat told me that my lady Moll’s cook had filled a basket with roast meats and a pie. She nosed beef and mutton before the knave thrust her away. 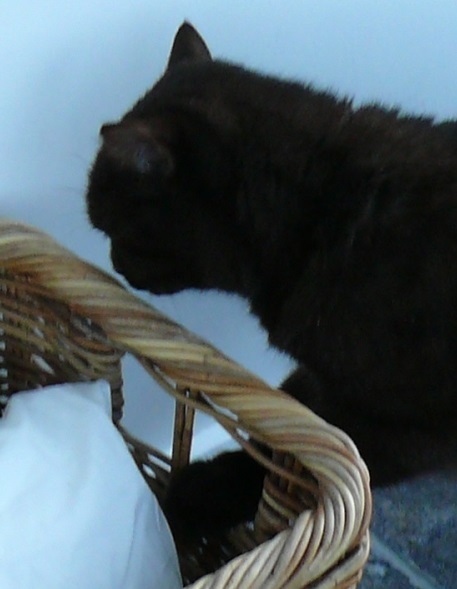 A stable boy took the basket, and she has not seen it since. For a time all seemed quiet. Then strangers came to my house in the dead of night. I arrkst myself what this meant. I did not see them, but I heared them and I nosed them. 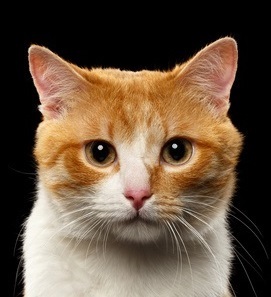 Next came Nero, calling, “Hot newes.” Here is the tale he told when we assembled at the Cats’ Field. “My master goes no more to sea,” sayt Nero, “but he and a friend have a boat. We, being curious, set forth to Hammel haven. There came cannon shot from the near castle [St Andrews], which stung mine ears and affrighted many who were fishing. “I espied upon the water a vessel that my master sayt was not on lawful business. I saw it put ashore at the far castle all call Calshot. Some men went to the castle gates for admittance. “Then my master and his friend complained they could see nowt, and we came home. 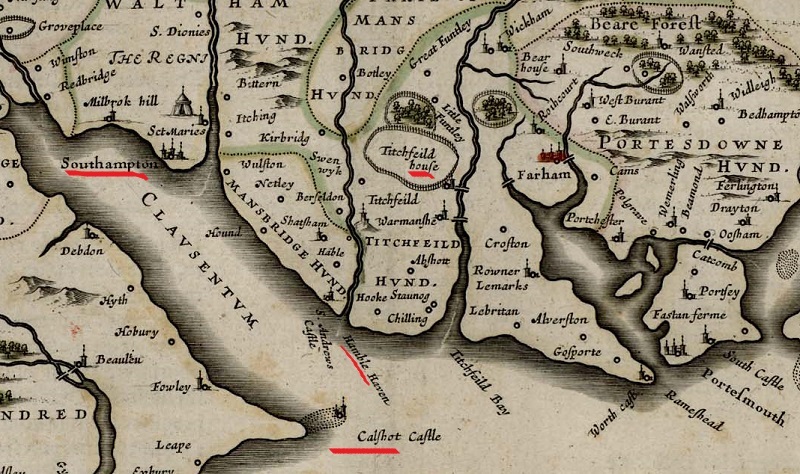 A section of a 17th century map of Hampshire, showing the locations Nero refers to. Marked are Southampton, Titchfield House (i.e. Place House, where Gib lives), Hamble Haven (where Nero claims he went) with St Andrews castle nearby, and Calshot castle across the water. “When next we visited the haven, my master spake with a woman selling fish. She’d heard that the Captain of Calshot was in Southampton, and his deputy too. The master gunner at the castle had confined the men, and taken their weapons. When Nero sayt that, a great screech went up. Many turned to me and our kitchen cat. Linkin bristled up, but other cats called for peace. They wished to hear more from Nero. He sayt, “I was with my master at the key [Hamble Quay] when one of the Captain’s men came from Southampton. He was full of beer and woe, for he knowed he did wrong. He brought warning from the Captain that the men should flee the castle, because the Captain had received letters that left him no choice but to send orders for their capture. “Next came a gentleman from Southampton, who also hired a boat to carry him to Calshot. I slipt aboard, and none sayt me nay. 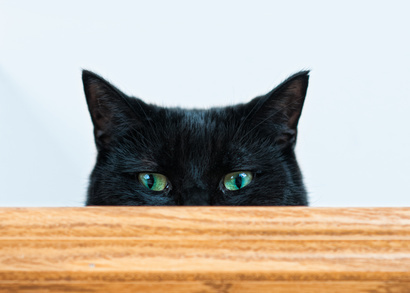 All know a black cat brings good fortune. “We crossed the water, and the gentleman entered the castle. After sunset he and a dozen men made haste into the boat, so weighting it we was scarce above the water. My luck held, and we came safe to our shore. I heared one enquire of a Mr Timmick [Dymock] if he knew the way to Titchfield. He replied that he would know it at midnight. Nero was toying with me. He knows full well where they are. As do I, now. That took the wind from Nero’s sail. And I care not if Linkin runs to tell his mistress. She will not take his meaning. 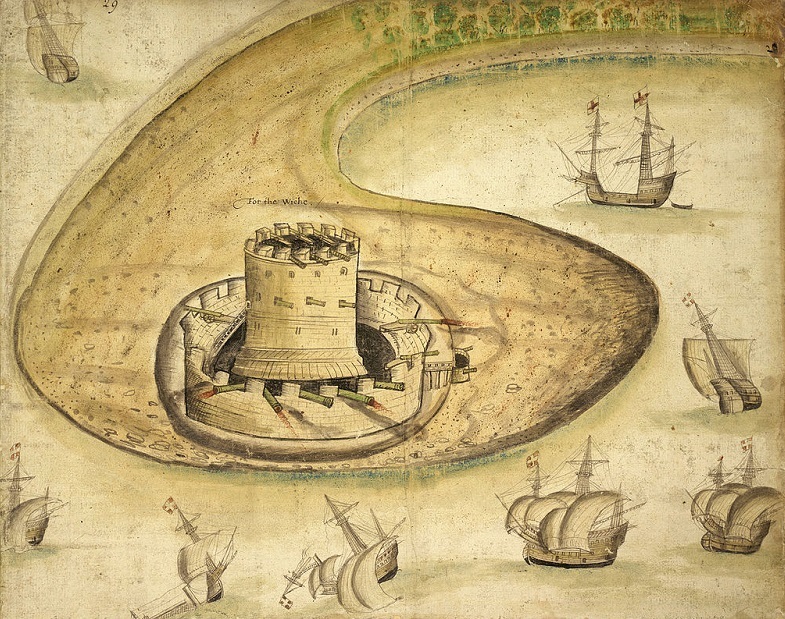 Calshot Castle, one of a number of forts Henry VIII had constructed for coastal defence. It’s not surprising that Nero should have been so well-informed. His old sea-captain master would have had many contacts around the coast. It seems the Danvers brothers’ escape plan meant keeping ahead of the hue and cry until they could get a passage to France. Pretending they and their helpers were soldiers bound for Brittany, and hiding at Calshot castle (with the Captain’s connivance), was a bold move. The plan fell through after official word of the killing reached Southampton, and the Captain had to take action. The brothers fled back to Place House. They’re next heard of in France. There was a formal examination into the matter in early January 1595. Statements from a stable boy, several Hamble locals, soldiers at Calshot, etc. are recorded in the Calendar of the Manuscripts of the Marquis of Salisbury (“the Cecil papers”) Vol V pp 84-90, available on line. Then the inquiry fizzled out, presumably because the Earl of Southampton’s involvement was so obvious. Some of his closest servants and attendants – his steward, the keeper of his wardrobe, his barber, his gentleman of horse (stables manager) – were mentioned in the statements, though none appears to have been interviewed. An interesting example of the extraordinary influence an Elizabethan Earl could wield in his home territory.